Now that we are in the Thanksgiving and Christmas seasons, it gives me an opportunity to reflect on whom I am thankful. With so many wonderful individuals who have helped me on so many critical fronts, it is difficult to call out just one person. But, allow me the privilege to acknowledge one of my legislative warriors. The city of Laguna Beach has a real gift in Councilman Bob Whalen. Bob is a public finance legal specialist and I’ve known him since my OC Treasurer days. Bob called me in 2016 with a bill proposal. I informed him that the bill deadline was only two hours away and asked if he had something already written. My staff was dubious that anything would come of such a complicated proposal. They were less sure that an already busy local elected official would put in the requisite time to make the bill a success. But he did. It became SB 1463. It’s one thing to give me a bill idea, it’s another to work it. If people want to know how to earnestly work a bill, they should look no further than Bob Whalen and the rest of the top-level staff all across the City of Laguna Beach. They take their jobs to protect their constituents very seriously and I was thankful to have them as allies. They provided voluminous background and support documents. They traveled to Sacramento to talk to all the consultants and members of the legislature that would let them in the door. Bob testified at the Committee hearings, which included Senate Energy, Utilities and Communications, Senate Natural Resources and Water, Assembly Utilities and Commerce, and Assembly Natural Resources. Laguna Beach had suffered from tragic wildfires and addressing one possible cause was a righteous pursuit. The Legislators up and down the state had observed similar tragedies and voted in support. Bob brought his foresight, expertise, drive and connections. In the Assembly Utilities and Commerce Committee meeting, he bantered with the Chair and his old friend, Assemblyman Mike Gatto. After all of the work that went into SB 1463, it was a heartbreak to receive Gov. Brown’s veto. In the two years subsequent, we’ve seen horrific fires started by electric power lines generating the sparks that started the conflagrations. Bob Whalen was prescient. And the proposed remedies are still required. Although Governor Brown vetoed this now obviously very necessary bill, Bob is still messaging for the need to address utility lines in wildfire zones (also see MOORLACH UPDATE — Black Malibu — November 23, 2018 and https://youtu.be/Hh115Rww21A). Councilman Whalen provides his perspectives in The Sacramento Bee, which is the first piece below. San Diego County’s school districts are still reacting to my Unrestricted Net Position study of California’s 944 school districts. It has generated the necessary buzz to get school superintendents to take a closer look at their district’s balance sheets. The Valley Roadrunner provides another perspective in the second piece below. * MOORLACH UPDATE — San Diego County School Districts — November 7, 2018. * MOORLACH UPDATE — Public Schools Financial Crisis — November 3, 2018. I want to compliment Superintendent Ron McCowan of the Valley Center Pauma Unified School District. Rather than deny that there is a problem, or directly challenge the bounds of the study, he gave serious consideration to the research and asked his staff to review and respond. He could have easily brushed the study off and justified their position, but I think that he will be earnest in doing the things necessary to right their fiscal ship. And this is the goal of the research we pursued. I urge other superintendents and school business officials to do the same. If they think that the numbers poorly reflect their financial position or they have legitimate reasons why they might be in the shape they are in, then it is up to them to justify it to their residents. Come next year, the numbers are likely to be worse once they add in some of their other unfunded liabilities as related to their retiree healthcare costs, which are likely considerable. A warning. If we have any hiccups in the economy in the near future, education funding usually takes a hit because of the complicated funding formulas of Proposition 98. So while the revenues may be fine now to cover the regular costs, the liability payments could easily outstrip their non-obligated funds. 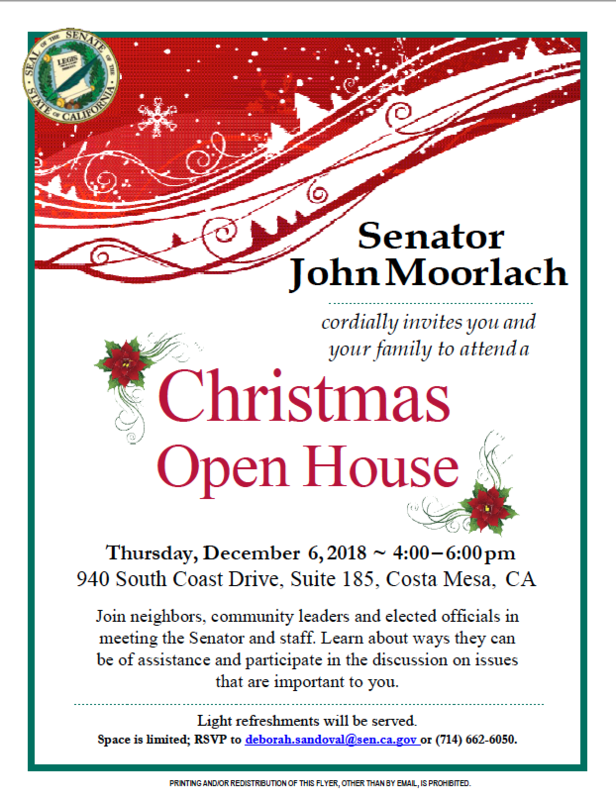 BONUS: You’re invited to visit our District Office for our annual Christmas Open House. The event will be held on December 6th from 4 p.m. to 6 p.m. Dress is Christmas comfortable. Wearing a Reyn Spooner Christmas shirt will get you an extra cookie. The invitation is the third piece below. On its website, PG&E states that it costs $3 million a mile to bury lines, about four times the cost of an overhead system. But some estimates put the utility companies’ potential liability for the 2017 and 2018 fires at more than $20 billion — enough to bury many hundreds of miles of lines. Robert Whalen is a city council member and former mayor of Laguna Beach. His email address is bobwhalen1. A study ranking schools according to the “financial soundness,” something many of them have never considered before, is causing a stir all over San Diego County school districts. “I’ve certainly never seen a study like this before,” admitted Jon Petersen, chief business officer for the Valley Center Pauma Unified School District. Petersen and his boss, Supt. Ron McCowan have reason to be looking at a new study released by State Senator John M.W. Moorlachentitled “Financial Soundness Rankings for California’s Public School Districts, Colleges & Universities,” which reviewed the financial soundness of all 944 California public school districts. Because it names the Valley Center Pauma Unified School District as among the highest (and therefore worst) in S.D. County in terms of how much each person living in the district “is in hock for, whether or not you attend school.” It’s also at a pretty bad ranking for the state as a whole: ranking 894 out of 940. Moorlach’s study uses a term called a UNP or “unrestricted net position,” which he uses to rank the school districts in California. Of course, “bad” and “good” are somewhat meaningless terms for this kind of data, since it apparently has no bearing on, say, how much operating funds the district has, or how much it pays its teachers. It might be compared to a home owner who is underwater in his loan. Unless he needs to suddenly sell his home, or, heaven forbid, it burns down, he won’t be affected. Senator Moorlach is considered something of a financial genius by fellow lawmakers. He’s the one who brought Orange County out of bankruptcy when he was its treasurer-tax collector. San Diego County Office of Education itself does rather well in the report, ranking tenth out of the state’s 58 county offices of education. On the other hand, San Diego Community College district ranks 47th out of 72 districts. “State Senator John Moorlach’s analysis provides insight into the challenges facing all school districts in light of future liabilities for post-employment benefits and pensions. He focuses on the unrestricted net position of school districts, which is not an income statement, but rather a balance statement, which reflects the district’s assets minus its liabilities. “Recent new rules required for government agencies require us to report pension liabilities and other post-employment benefits on our balance sheets. This drove us further into a negative position, just as it has done for most school districts. “This balance sheet issue, however, won’t have much immediate impact on our district’s operations. The growth in negative net position is unlikely to impact our programs and services. Our structural budget deficit, which also faces most districts, is our more immediate concern. We will be developing budget reduction proposals to address next year’s budget, which will also help with the long-term negative net position issue. “We were surprised to read about Valley Center-Pauma’s relative ranking according to Sen. John Moorlach’s analysis. His approach to dividing the net position by the number of residents in the school district may be putting districts with large numbers of students relative to their overall population at a disadvantage in relative rankings. It would be interesting to evaluate net position by average daily attendance as well. Two years the district took out a $5 million loan to pay for more efficient lighting and air conditioning units. “I’m sure that’s listed as a liability,” said McCowan. In January is the new audit that will have the new numbers. At that time McCowan and his financial people will know better what the a UNP is and how it figures into the district’s basic fiscal health.